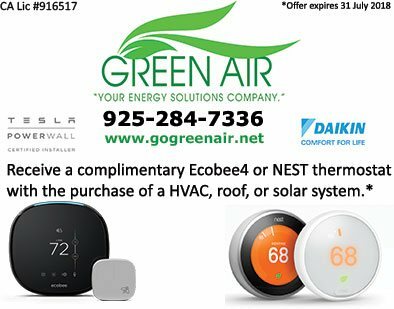 Green Air prides itself in being a top-quality Fremont, CA HVAC professional with a reputation for installing, replacing, repairing, and maintaining heating and air conditioning units with complete customer satisfaction. We treat each HVAC project as our own, and this mentality has helped us gain the loyalty of our customers. We’re all about setting high standards for ourselves and providing the greatest value to our customers time and time again. Green Air boasts of a team of experienced and highly trained HVAC technicians ready to provide Fremont residents with the quality HVAC workmanship they seek. Our HVAC technicians make it a point to understand the unique needs of each homeowner. You can trust us to work with you to create cost-efficient solutions for maintaining and repairing your HVAC systems. Aside from HVAC systems, Green Air also offers a range of services that include the installation of solar and Certainteed-certified roofing products. Whatever you needs may be, we make sure to listen carefully to your inputs and to bring you custom solutions that fit in with your vision of what your home should be. Moreover, we bring you peace of mind by working only with topnotch industry-recognized products, such as Certainteed®, LENNOX®, and Daikin. As certified Certainteed Master Elite and Certainteed Green Roofers, we offer expert installations and stellar craftsmanship backed by outstanding warranties. If budget is a concern, there’s no need to fret. We offer zero down payment, 100% Financing for your energy-efficient upgrades through home improvement financing companies such as HERO® and YgreneTM. You can enjoy repayment terms of up to 30 years through your property tax bill. We invite you to contact us at (925) 62-SOLAR or (925) 28-GREEN or fill out our online contact form for a free quote. Let’s start discussing your HVAC and roofing needs right now.